Direct Experimental Hi-Res is no less or no more VS OpenSL ES HD. It's just a different way of doing the same thing - providing audio beyond 48khz/16bit. 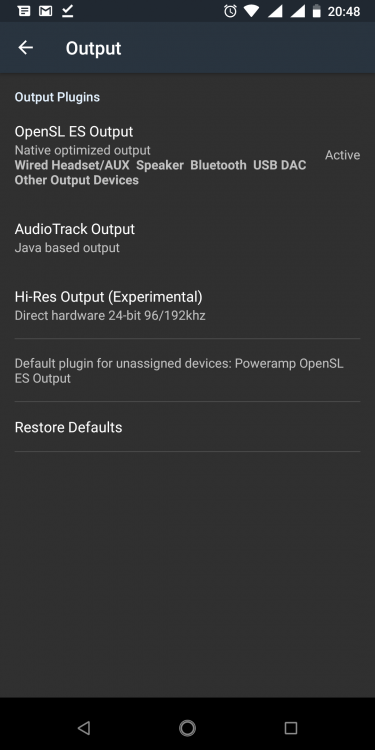 I can't confirm if any custom ROM actually produces Hi-Res output, as for the stock ROMs - I test each build on each Hi-Res capable device in my test lab by capturing audio and analyzing spectrum - and most devices do produce real ultrasound up to 96khz (and above e.g. for Snapdragon 835 with 384khz sampling rate). 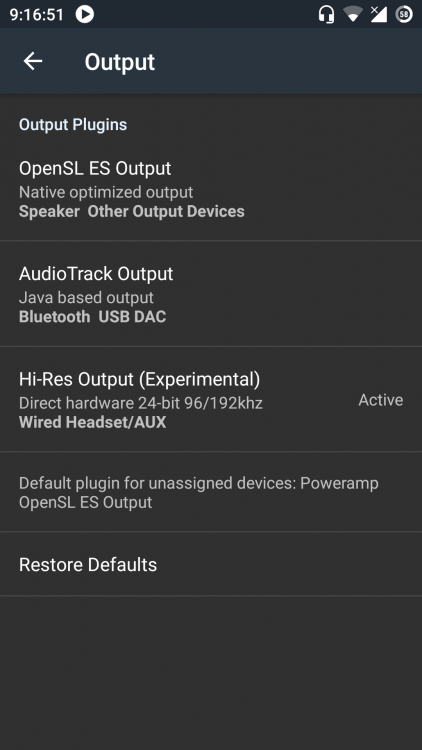 Only few devices are known to advertise Hi-Res, but have no real Hi-Res output from stock or any other player, including Poweramp, on Hi-Res files (Asus I'm looking at you), despite in fact running all the audio/drivers/etc. on 192khz. I can remember there was a way to check this with some code in the terminal, do you do the same thing? 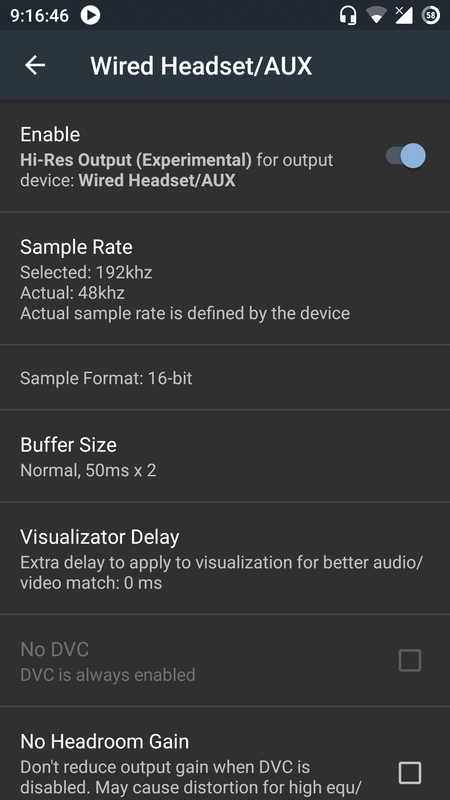 Various 0x... can be anything, but Standby should be no, Sample rate, obviously, 192000 (or the other selected in Poweramp audio output settings), format should be something with 24 bit, FLOAT or 32 bit. NOTE: for Samsungs, this is completely different (they have non-standard audio pipeline even on Qualcomm SOCs), also few other devices have different dump format. (Corrects) working after the restart ? Why do not support Android 7 ? Build 790 works well with HD Output on my device which system is based on Android 7.1.1. It does work on (non Compact) XZ @ 8.0.0 - via OpenSL ES HD. What is your Android version? I will try to get XZ1 variant and will check what's happening there. Thanks for the report. Build 790 has no device filters, thus it does play hi-res even if device doesn't actually support that. This is not a desired way of playing audio, as there is double sample rate and format conversion: first upsampling e.g. to 192khz/24bit, then downsampling by Android (so-so) resampler back to 48khz/16bit. The upsampling to Hi-Res is not a bad thing, but that following Android downsampling is. (There are additional possible resampling steps in hardware, as usually they are 1-bit DACs running on very high sampling rate). Emmm, I know that process and I have used adb command to see the audio output information. 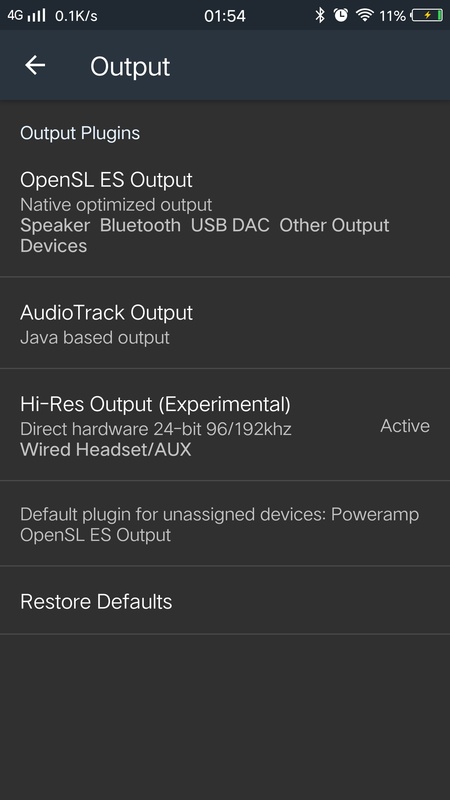 On my PC screen, the audio output information shows my device work well with HD output. 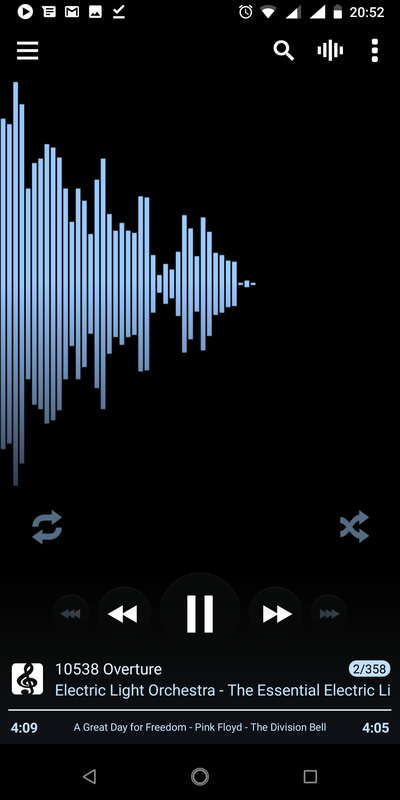 Besides, the player also show that it processes audio properly. I have upload the audio information and you can also see the differences from the picture(you can download the picture if not clear). 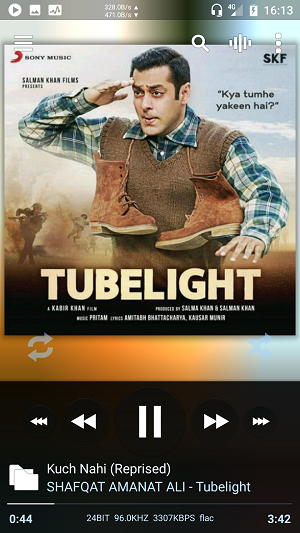 The first column is vivo music player which is the default player. The second is poweramp_build_790 under HD Output mode and the third is build_705 under Hi-Res mode. They all play the same song which is 64bit 192khz 24576kbps PCM_F64LE. 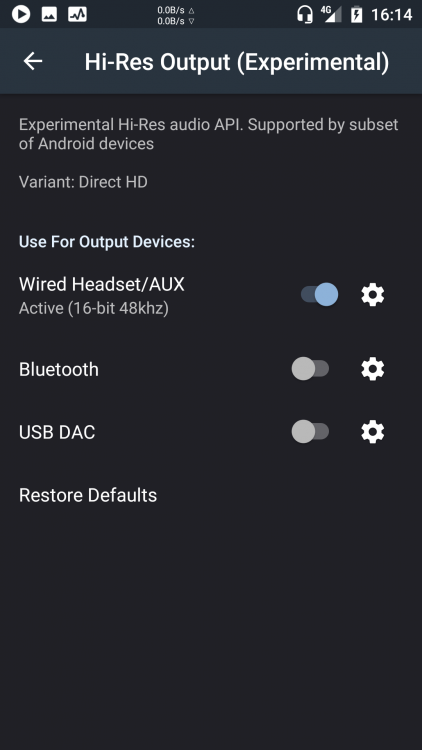 My phone has a mode called HI-FI and it seems that the HI-FI mode can be actived only when "Output thread 0xf1783000 type 0 (MIXER)" is used. These guys are already sawing for two years audio mode for most devices. I think they will help and prompt. Эти ребята пилят уже в течении двух лет аудио мод для большинства устройств. Думаю они и помогут и подскажут. And it's weird that build 790 works properly under HD Output mode but not Hi-Res. Now, build 705 seems to work properly under Hi-Res mode(it just seems because no HI-FI sign on the status bar and I haven't seen the audio output information through adb command) and it has no HD Output option. My English is poor and I'm sorry for that. What prevented to release this last May? hi @maxmp thank you for the great work , amazing, have you planned to add grid view for album artist listing in next betas? Hey, @maxmp, Hi-Res output doesn't seem to be enabled on my device. Axon 7 A2017G, AEX 5.5 (Oreo 8.1) with the latest Ainur Sauron installed. 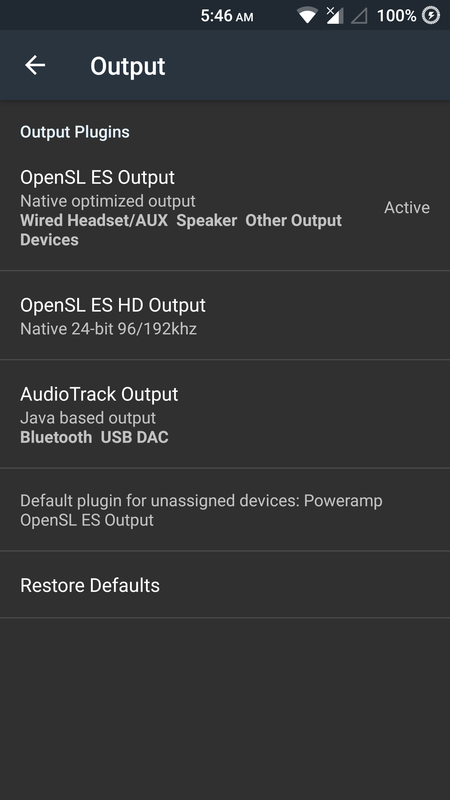 I can't use OpenSL HD either since it's only limited to Bluetooth and an external DAC. Also, a lot of music won't play at all or at least won't have any sound when playing. The seek bar progresses, but there's no audio and the visualizer just maxes out and fills my screen. @maxmp, THANKS for the update (705)! Seems to work great so far for me (LG v20). Can you confirm if the quad-DAC in this device is indeed utilized with the Experimental Hi-Res output? 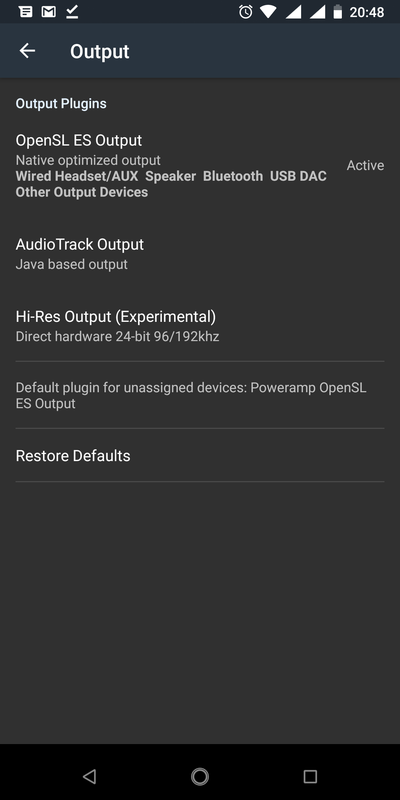 @maxmp As had been discussed by other users I'm missing Hi-Res audio on my Redmi note 3 running custom Oreo 8.1. It used to work on stock Android 6.0. I'm currently rooted right now so can you tell what all files I need to check to make sure my ROM supports it? HTC10. When I enable the Hi-res output, the sounds comes out of the speakers only, not from the headphones. Where is the problem? Also, isn't it possible to make the output to always match the source's sample frequency? This would be a great addition which would prevent us to manually change it every time we play a different source. I updated it... But only works with earphones... No sound in the phone speakers. In me case the sound doesn't come out from speakers... Only with earphones.